in the Fourth Floor Training Room. This proposed road project starts at Route 419 and will upgrade the private driveway to Chuck E. Cheese to public road standards. A new road segment will be constructed between the end of the private driveway and Almond Road, an existing private road. Almond Road will be rebuilt to public road standards to the intersection with Chevy Road, an existing public road. As future development takes place, an extension from the Fallowater Lane/Almond Road intersection to Elm View Road could be constructed as part of the development plan. 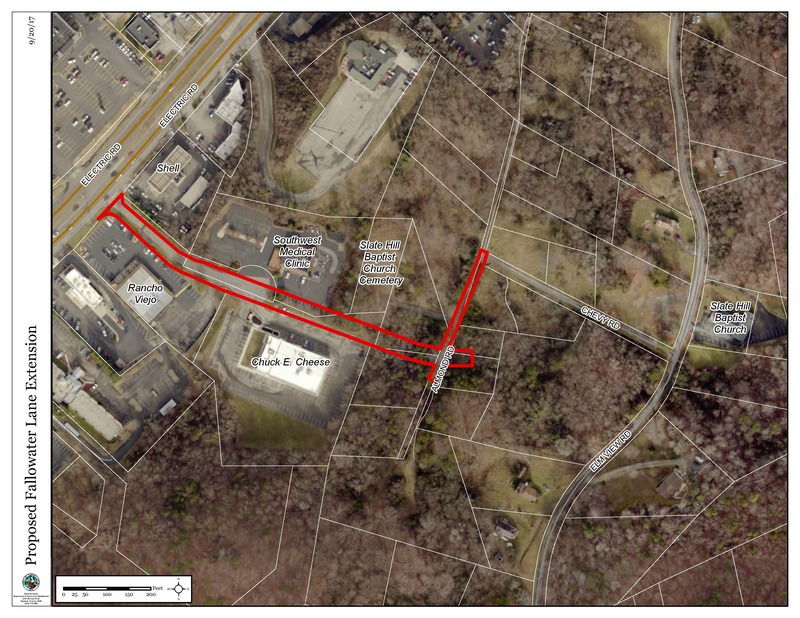 The overall project, as recommended in the draft 419 Town Center Plan, proposes to extend Fallowater Lane from its current terminus at Starkey Road and Fallowater Lane (on the Food Lion side of Old Country Plaza) to a new intersection at Route 419. Fallowater Lane will then continue up a private driveway, past Chuck E. Cheese, to eventually terminate at Elm View Road. This connection will provide appropriate access to future multifamily development anticipated for the land designated as The Ridges in the draft 419 Town Center Plan. The project is funded with Secondary Six Year Improvement Program and Revenue Sharing Program funding. Preliminary Engineering is underway and construction is anticipated in FY 2021. Click the image to the right to enlarge the concept plan.